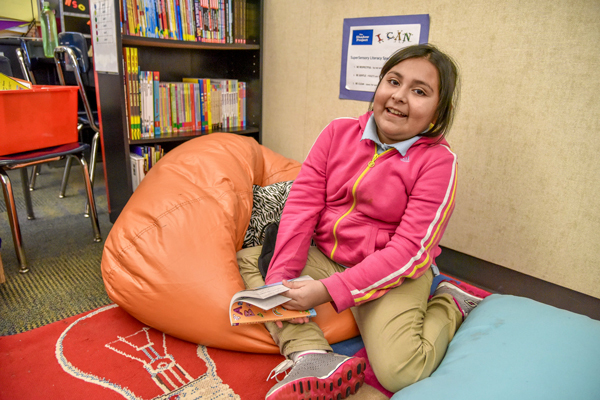 Students with learning challenges at Rosa Parks Elementary are reading and succeeding in their general education classrooms after The Shadow Project provided sensory tools to all teachers, along with five hours of professional development, to increase equity. Fifth-grader Magali has learning challenges, but spends most of her day now in a general education classroom. When testing, she wants a fidget to squeeze to stay focused, and now they are readily available to her so she doesn’t have to spend valuable class time looking for what she needs to be productive. 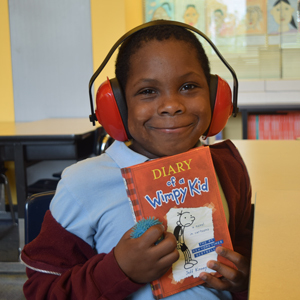 Third grader Tay was several grade levels behind in reading and used to say, “I’m not smart,” until he began using sensory tools from The Shadow Project. Now, six months later, Tay wears headphones when doing schoolwork to “block people out,” and he has stretch bands to kick on the bottom of his chair, releasing excess energy in a positive way while staying on task. “Whoever came up with fidgets, that’s the best idea ever,” said Janet, who has bought sensory tools for home, including chewable erasers, squishy handheld balls … and several pairs of headphones. “He’s got more confidence and motivation,” said Janet. “Tay actually likes to read now, and he reads every night to his four-year-old brother.